Judy Garland is rightfully a show-business legend, a tremendous vocal talent whose life ended in tragedy after years of getting knocked around by the studio system. She died at age 47 of a barbiturate overdose in London in 1969. Garland has been portrayed on the small screen before: her early MGM days in 1978’s Rainbow, with Annie star Andrea McArdle; a more extensive look in 2001’s Life With Judy Garland: Me And My Shadows, with Tammy Blanchard as young Judy and Judy Davis taking on her adult years. 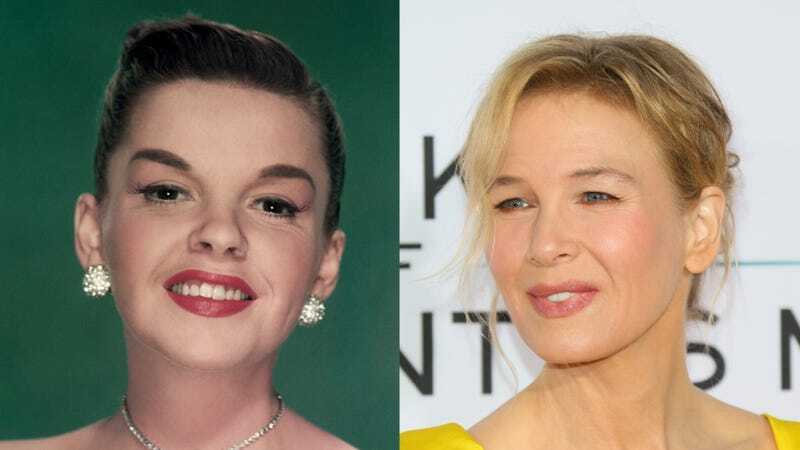 But for the first time, a Judy Garland-focused bio will reach the big screen. Deadline reports today that upcoming film Judy will cover the era of the star’s 1968 concerts in London, just a year before her death. Renee Zellweger, who proved her considerable pipes as Roxie Hart in 2002 Best Picture winner Chicago, will play Garland. Look for lots of flashbacks over Garland’s four-decade career, as well as a fledgling romance with younger man Mickey Deans, who would become her fifth and final husband. The Crown’s Tom Swift has penned the script, which hopefully will do justice to the considerable resonance of Garland’s career, as well as the open emotionality that connected so well with audiences and made her a star like no other.